The BaByliss for Men 6-in-1 grooming kit has a whole set of useful features. 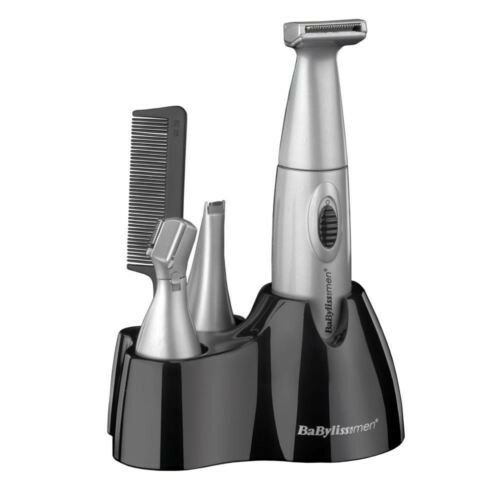 For a start there are 3 interchangeable trimming heads - a precision trimmer with 2 comb guides, a hygienic trimmer for ear and nose hair and an eyebrow trimmer with comb guide. Comes complete with comb, cleaning brush and convenient storage stand. 2 x five-position comb guide for moustache trimmer. 1 x two-position comb guide for eyebrow trimmer. Accessories include: moustache comb, cleaning brush and oil.